WELCOME TO THE JUNE 2017 EDITION OF THE GO LOCAL. GO TEXAN. E-ZINE. barbecue sauce. 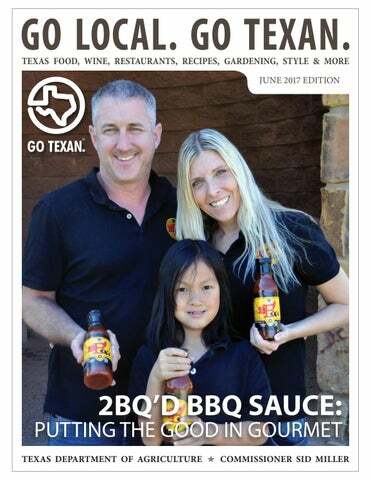 2BQ’d BBQ Sauce is an award-winning barbecue sauce that’ll put a smile on your face. Read about why they donate a portion of their proceeds to help fund Smile Train, the leading children’s charity for cleft lip and palate surgery. If you’ve been looking for more style advice from this e-zine, you’ll appreciate our story on Texas Carpet Baggers this month. They make high-quality fashion accessories like wallets, purses and bags in Bulverde, Texas. We also talked to the folks at Sogo Industries; they sold out of all their plastic kitchenware at our GO TEXAN booth at the San Antonio Stock Show and Rodeo a couple months back. I recently visited their factory in Houston and was very impressed with their Texas operation. As always, we’re happy to show off the wide diversity of our GO TEXAN members and promote the best of Texas. We hope you’ll enjoy this issue. Be sure to share it with your friends, and remember, Texas Agriculture Matters! Yet, when it comes to BBQ sauce, most folks aren’t looking for healthier alternative. Customers just want something that tastes great. 2BQ’d is rising to the challenge and standing out, because their sauce is both delicious and healthy. While taste may be king in the BBQ world, Kim is the queen in the McGrath household; and when the queen wants healthy food on her table, she gets it. “The biggest challenge facing our company is changing how people view barbecue sauce and knowing that a healthier, tastier alternative is in the marketplace,” McGrath said. “There are many barbecue sauces in the industry, so our mission is educating people on the importance of healthier food choices for themselves and their families.” Creating that perfect complement for the many flavors and items on a diverse barbecue menu is not an easy task, but one that 2BQ’d is more than up for. One taste and people will see that they’ve achieved that goal. out. 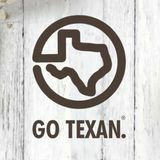 They quickly took advantage of opportunities that the GO TEXAN program made available to them, like meeting with grocery retail buyers, as well as selling and sampling products at the State Fair of Texas. It was at events like these where Kim and her husband, Sean, didn’t wait for introductions but quickly made friends with the fellow food vendors and businesses around them. They were able to meet and impress a co-packer that has now taken their recipes and preparation out of the kitchen and into the commercial retail big world. therapy and a lot of love, Mei-Li is a happy, healthy 7-year old child. She’s also the inspiration for Kim and Sean to donate a portion of the sales of 2BQ’d to Smile Train, a nonprofit organization that corrects cleft lips and palates in children all over the world. Through the corrective surgeries, these children get a chance for a normal life without serious setbacks in growth and development. at the Cuero Pecan House, it is by far the favorite of the owners and customers alike. with J.F. Elder. He spent each busy pecan season — November through mid-January — in Cuero brokering and cracking pecans for the general public. He would then close the doors of the seasonal business until the next pecan season. items, casseroles, cookies, pies, cakes and candies â&#x20AC;&#x201D; all made from original recipes. They also carry pecan oil, which does well when making a light salad dressing or cooking due to its neutral flavor and high smoke point. Their innovation in the kitchen and their diverse array of products and services allow the Raths to stay in business year-round. Customers flock to the store often to purchase their favorite items and to see what new items have hit the shelves since their last visit. “I designed the Ms. Kitty in 2013 for my ladies who carry handguns,” Feeley said. “This latest product makes up 90 percent of our sales, and we sold approximately 600 bags last year.” The challenge Feeley faces with her company is convincing women that they should pay $300 to $400 for a handcrafted handbag by a very small, no-name designer. This lack of name recognition is changing little by little. industry that prefer to cut costs with less expensive materials. In the end, it’s the satisfied customers who are helping her grow. Feeley offers customers a chance to design their own handbag in her design studio. Now women can come in, design their own handbag, shop from the current selection and even come back to watch the bags being made. hen SOGO Industries began back in 2007, it was with the idea of high functionality, affordability and fun in mind. SOGO began importing and distributing plastics and housewares while testing the market to see what people favored. Today, SOGO Industries is available at many different grocery markets across the country. The word “plastic” is derived from the Greek word plastikos, meaning “capable of being shaped and molded.” To Namit Varma, the president of SOGO Industries, this serves as a reminder that SOGO Industries products serve many different consumer needs. Left to right: Julie Huang Yim, Major and Autumn Carter, Namit Varma, Sid Miller, Sumeet Varma and Tony Sharp. of our customers don’t even realize their lunch box or crawfish tray is sourced locally here in Texas. They enjoy our products for their affordability, function and bright color schemes, but many of them don’t realize they are also supporting a local brand.” Commissioner Sid Miller’s visit earlier this year offered him a close-up view of their operation. “It was great meeting with the fine folks that run SOGO Industries in Houston,” Miller said, “and when they showcased their product at the San Antonio Livestock Show and Rodeo, they completely sold out.” Interested in purchasing SOGO Industries products? Check out their website to see where you can buy local today! TEXAS PEACHES: A SHORT PRIMIER Usually peaches are associated with the state of Georgia; however, in Texas, we have approximately one million peach trees. Yes, you read that right, one million! More impressively, only half of these trees are planted in commercial orchards of one acre or larger. The demand for locally-grown peaches is always strong, and the market is even stronger for this delightful fruit. year. Another popular destination for Texas peaches is the Texas Hill Country. From Johnson City to Fredericksburg, you can find a great variety of peaches, and there’s nothing better than a fresh Texas peach. 2BQ’D RECIPE: ROASTED CORN POTATO Here’s a tasty potato salad from our friends at 2BQ’d BBQ Sauce that can be served warm or chilled. Serves 4 to 6. Directions: 1. Place potatoes in a pot with enough water to cover. Bring to boil. Reduce heat and keep simmering with the lid on the pot until the potatoes are cooked. 2. Meanwhile, heat a skillet over high heat, and add corn tossed in light oil to sear it. 3. Place corn in a large mixing bowl with the onion and pepper. Refrigerate.